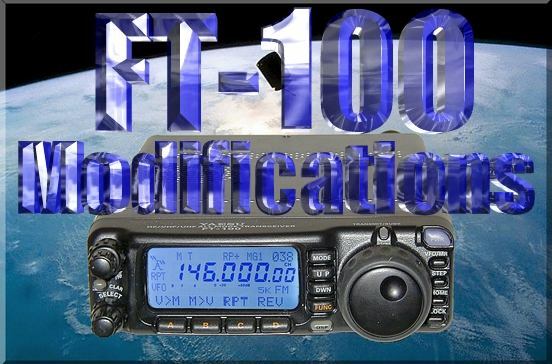 This modification opens the Yaesu FT-100 for full transmit on the HF, VHF, UHF bands. All memory channels will be lost. Repeater offsets remain intact for USA versions. Remove Front Panel from radio and open the rear cover from the Front Panel unit. Be careful, a cable connects them together. 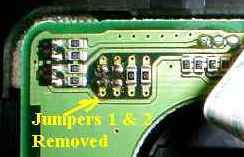 Locate and remove R6035 (1) and R6036 (2) on the display board. Note: The factory removed R6035 on my radio so I only had to remove R6036. You should end up like the picture below. Back of front panel. Top left corner.Remove jumpers 1 & 2, leave 3 & 4. Reassemble and install the Front Panel on the radio. Press [DPS] and [LOCK] keys, while holding them in, press and hold the [PWR] switch for 1/2 second to turn the tranceiver on. Wait for the tranceiver to initilize itself. You WILL LOOSE all memory channels programmed. Turn the tranceiver off. Press and hold [DWN] and [STEP] keys; while holding them in, press and hold in the [PWR] switch for 1/2 second to turn the tranceiver On. Now let go of all keys.The display will read "r on" for a 1/2 second or less (it may be so quick that you don't see it but continue with the mod). Press and hold [DWN] and [STEP] keys; while holding them in, press and hold in the [PWR] switch for 1/2 second to turn the tranceiver On. Now let go of all keys.The display will read "HF on" for a 1/2 second or less (it may be so quick that you don't see it but continue with the mod). Set the dial frequency to 549.61163MHz You will need to use LSB, USB, or CW to get the last digits. After you enter 549.61163Mhz, press the MODE button to go back to FM Mode, and turn the power off. Press and hold [DWN] and [STEP] keys; while holding them in, press and hold in the [PWR] switch for 1/2 second to turn the tranceiver On. Now let go of all keys.The display will read "vU on" for a 1/2 secondor less (it may be so quick that you don't see it but continue with the mod). The modification is complete. Turn the radio off and back on tocontinue. RX & TX: 1.8MHz-30MHz, 50MHz-54MHz, 140MHz-174MHz, 420MHz-470MHz. Their is a second set of menu functions F01 to F59. WARNING: changing these will reset all the memories. I want to warn you do not change these values unless you are sure of what you are doing. To get them turn transceiver off. Press and hold the A,B,C keys; while holding them in, press and hold in the [PWR] switch for 1/2 second to turn the tranceiver On. Now let go of all keys. Then press and hold func key for 1/2 second to get to the menu and then rotate the select knob to get to a second menu (F01 to F59) it's after #66 or before #01. When you turn the rig off and back on it returns to normal menu. Here is a list of the 59 second menu functions. You can also see a tabular list of settings that compare this radio with the Yaesu suggested defaults.